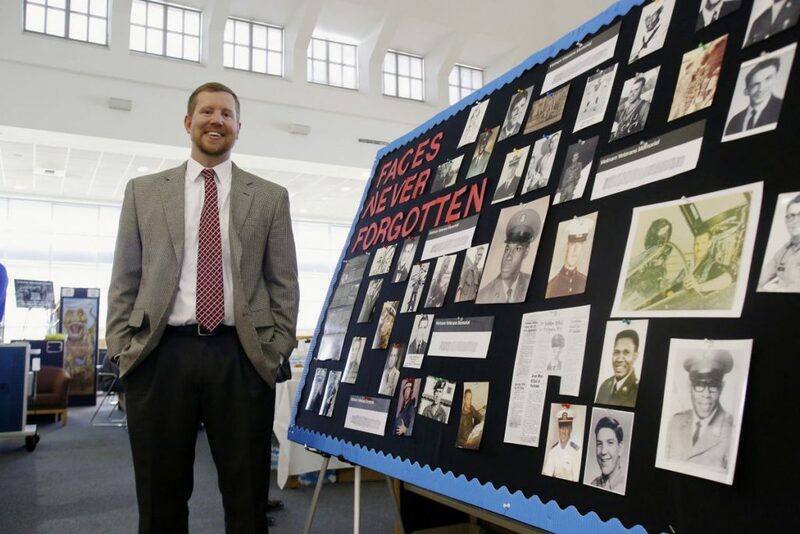 Blake Busbin, Ph.D., the Advanced Placement U.S. History teacher at Auburn High School, just wrapped up a three-year oral history project during which his students interviewed scores of military veterans from East Alabama and West Georgia. In addition to being on the project website, many of the recordings are also housed in the Library of Congress. The interviews covered World War II to the present War on Terror, but primarily focused on Vietnam vets. One of Busbin’s close collaborators was College of Education Professor Jim Witte, who served two tours in Vietnam as a helicopter pilot. As the veteran’s project is winding down, Busbin is preparing to lead his students on a new three-year undertaking. For his innovative work in Project Based Learning (PBL), Busbin was recently named the 2017 Alabama History Teacher of the Year by the History Channel and the Gilder Lehrman Institute of American History. He is also one of ten finalists for National History Teacher of the Year. All three of Busbin’s degrees came from the College of Education in the Social Science Education program. Following his undergraduate degree he won a Madison Fellowship which funded work on his Master’s. During this period he was recruited as an emergency substitute at AHS, and has been there ever since. He taught American Government before switching over to U.S. History, which he calls “America on a sprinter’s pace” since it covers so much material in a limited period of time. So how did an Atlanta boy who dreamed of becoming a minister or lawyer end up at Auburn in the College of Education? Busbin recently won a grant from the Alabama Humanities Foundation for the Civil Rights Project. He said it was the most rigorous writing he has undertaken since his dissertation, which focused on student collective decision-making about controversial issues in online and face-to-face settings. The tour will make a final stop in Birmingham before returning to AHS. Saye noted that in addition to his solid classroom work, Busbin continues to serve Auburn and the College of Education. Busbin knows that being a great teacher is about more than mastering subject knowledge.